HomeBlog March 2015 Mod Podge Mod Melter -- A New Tool ... Perfect for Every Crafter! Mod Podge Mod Melter -- A New Tool ... Perfect for Every Crafter! 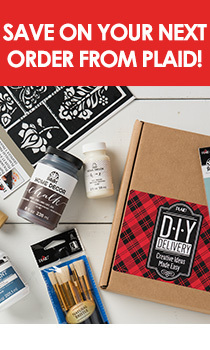 Continuing with our National Craft Month blog posts, I thought it would be fun to present to you a brand new tool that Plaid just released yesterday on HSN, it is the newest member of the Mod Podge family ... the Mod Podge Mod Melter! TA DA!!! The Mod Melter release yesterday on HSN has it almost sold out, and it is available at www.ModMelter.com! Our Mod Podge Mod Melter is a very unique tool that takes the traditional hot glue gun to a whole new level. It can be used as an all-purpose, mini high-temperature glue gun, but it is also specifically manufactured to be used with Mod Podge Mod Melts to create Mod Mold embellishments. The Mod Melter has a unique shape which allows each crafter to hold it vertically giving an unobstructed view of where you are working. The longer nozzle tip is wrapped in silicone, which allows for glue placement in tight spaces without fear of burning or melting those surfaces. The silicon tip also means less mess, as Mod Melts and hi-temp hot glue sticks do not stick to the tip. The Mod Melter is specifically designed to remain hot through an entire glue stick or Mod Melt. An extra-long 6 ft. electrical cord makes it convenient to move about freely while working on a project. The Mod Melter has a convenient on/off switch which allows the crafter to turn off the Mod Melter without having to unplug it. An extra wide built-in stand at the base of the Mod Melter enables the crafter to easily and securely rest it when not in use. The trigger is larger than most glue guns and is easy-to-press allowing additional finger placement which equalizes the pressure on the Mod Melter grip. A silicone soft grip on the Mod Melter body allows for a comfortable grip. Here you see the Mod Melter loaded with a Mod Melt Milk Glass White while the Mod Mold - Gems is being filled. It's so easy to fill the silicone Mod Podge Mod Molds - creating an embellishment for her crafting project. And here the Celebrations embellishments, created with the Milk Glass White Mod Melt, are shown being painted with FolkArt Acrylics! Check out the painted embellishments on the frame as well. The Mod Melter nozzle tip is the perfect size to fill all nooks and crannies of the detailed designed Mod Molds as well as the simple round lines of this frame shown below. Create a bunch of round frame embellishments and tie them with embroidery floss or twine as shown below and you can take a regular photo frame from plain to extraordinary! The Mod Podge Mod Melter is designed so that it can be used with all Mod Melts: Sea Glass Clear, Milk Glass White, Neon Colors, Opaque Colors, Metallics and Glitters. The project shown below illustrates how you can fill one mold with more than one color; notice the cherries were created with both red and green Mod Melts! I also want you to know that you can insert the Sea Glass Clear Mod Melts or any mini-sized hi-temp glue stick into the Mod Melter and it be used as a hot glue gun. Shown below is an ordinary fabric wrapped lampshade that is being upcycled with a tassel trim. Plug the Mod Podge Mod Melter into 120VAC Electrical outlet. Insert a Mod Melt or mini hi-temperature hot glue stick through the opening at the rear of the Mod Melter. Using the on/off switch, turn the Mod Melter on. After 5 - 7 minutes, the Mod Melter is thoroughly heated and ready for use. Direct the Mod Melter tip where desired and begin to lightly squeeze the trigger. The pressure on the trigger will determine the amount of melted stick released. If filling a Mod Podge Mod Mold, begin by directing the tip of the Mod Melter in the center of the mold impression and squeeze the trigger directing the melted Mod Melt until the entire mold is filled. If necessary, reload the Mod Melter with a new Mod Melt and continue working. Do NOT leave the Mod Melter unattended when not in use. After each use, turn the Mod Melter off and unplug it from the electrical outlet. Allow the Mod Melter to completely cool prior to storing. Looking for more product information or project inspiration? Check out www.ModMelter.com where you will find it all as well as the opportunity to purchase your own Mod Podge Mod Melter!